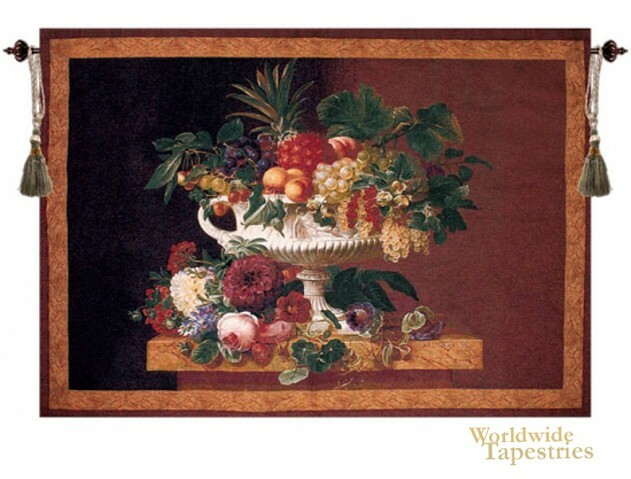 This Grecian Urn tapestry shows a cornucopia of fruit and flowers. Simply over brimming with the abundance of nature, this work shows color and composition beautifully laid onto the orate white Grecian style vase with handles. Peaches, pineapples and grapes are accompanied by roses and peonies, in a variety of colors. Bursting with color, this work is a celebration of abundance and plenty. This Grecian Urn tapestry is backed with lining and tunnel for easy hanging. Note: tapestry rod and tassels, where pictured, are purchased separately. Dimensions: W 70" x H 48"